This afternoon I took a walk in Nature. I needed some time to be by myself. We all get like that sometimes. I like to walk down to the creek and observe the beauty of this magical place. When I arrived Mr. & Mrs Beaver thunked themselves into the water. When someone dumped a tree down the edge of the mountain behind us, it caused their house to fall into the water with it so they have had to rebuild. This is my favorite place to hide from the world. Here I can go within. Back to my true self. Nature calls me here again and again. we haven’t mowed here for a couple of weeks so things are left undone. The wild creatures that live here want it left alone but sometimes we have to mow down there for our own safety. Being here in this place reminds me that I am not alone. I can connect with our Mother any time I feel like it. And today I feel like it. Why don’t more people realize this connection exists? The water in the creek rises and falls with each rain shower. 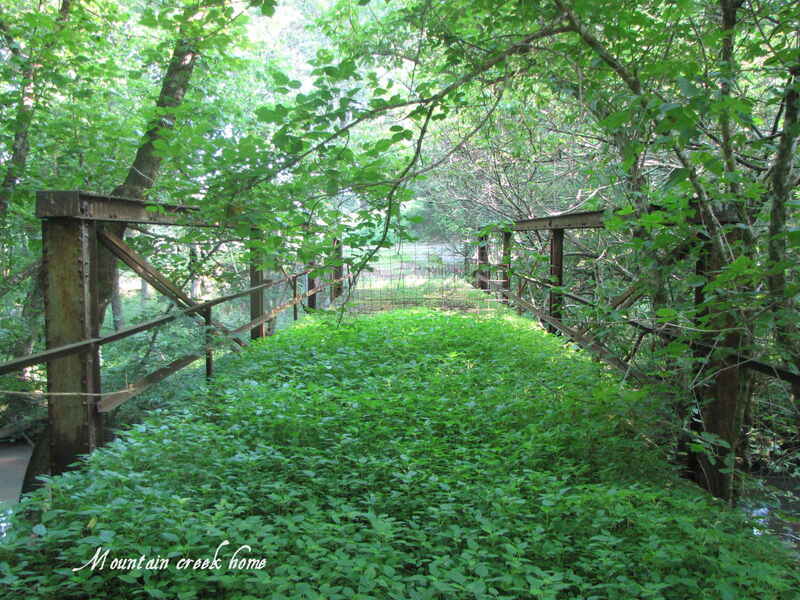 While down there I walk along the path that takes me to an old bridge now covered in lush green foliage. It reminds me of the bridges in the movie The Bridges of Madison County. So picturesque and effeminately a sight to behold. It looks like a scene from a movie that fairies would love to dance and play around.. I embrace this place like a marriage. With my full heart. I imagine in the past how grand this place must have been with the mill here along side the mountain with rushing water for electricity. How talented our forefathers were with their engineering. And imagine the lady wearing a large sun bonnet picking and preening over her golden yellow colored daffodils. From this distance I hear the rush of the rapids flowing by. So quickly yet so beautiful. I am of the element of water so I am at home here. I am at ease here and could just as easily fall into a deep sleep beneath the trees while the forest protects me from outsiders. Please note I do not own these pics so they are copyright their potential owners respectfully. I watermark them for reference sake. Nothing more. This entry was posted in Animal Conservation, EARTH EXCHANGE, Global Earth Exchange, Hunting, Meigs County Tennessee, Mountain Creek Home, Nature, Outdoors, Ten Mile Tennessee, White Tailed Deer, Wildlife Conservation, Wounded Nature. Bookmark the permalink.